Soft and fluffy cinnamon swirl bread with fresh cranberries and orange. 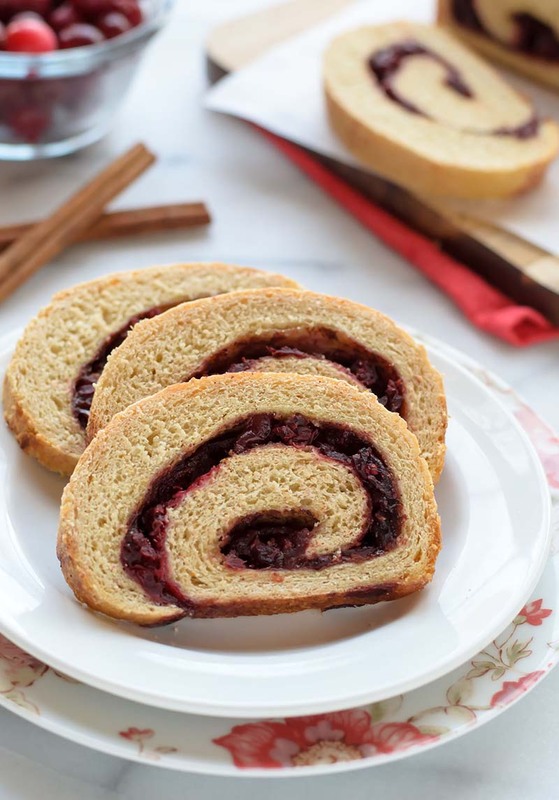 This recipe tastes so much better than store bought cinnamon swirl bread, is healthier for you, and you'll love the bright pop of festive cranberry orange flavor too! In the bowl of a standing mixer fitted with the paddle attachment or a large mixing bowl, stir together the all-purpose flour, white whole wheat flour, vital wheat gluten, yeast, and salt. Add the butter, egg, and orange zest. Heat the buttermilk and ¼ cup orange juice squeezed from the zested orange to 120-130°F. If the buttermilk separates, simply whisk it back together. Pour the liquid into the dry ingredients, mix on low speed (or mix by hand with a wooden spoon) until the ingredients come together and form a ball. Switch to a dough hook (or turn out onto a lightly floured surface) and mix on medium speed for 8 minutes or knead by hand for approximately 10 minutes, until the dough is soft, pliable, and slightly tacky but not sticky. Place the dough in a lightly oiled large bowl, cover with plastic wrap, and let rise at room temperature for approximately 2 hours, until the dough doubles in size. To check dough readiness, gently press the dough with two fingers. If the indent stays, the dough is ready. Prepare the cranberry filling: In a food processor, pulse the whole cranberries until they’re ground and pebbly, but not completely pureed, scraping the machine down once or twice. In a small bowl, combine the brown sugar and cinnamon. Set both aside. Lightly oil two 8x4-inch loaf pans. Divide the dough into 2 equal pieces (use a kitchen scale if you have one). Place one piece on a lightly floured work surface and pat into a rectangle that is 5 inches wide by 8 inches long. Brush with half of the melted butter, sprinkle with half of the cinnamon sugar mixture (it will seem like a lot, but pile it thickly), and scatter half of the cranberries over the top. Place rack in center of oven, then preheat to 350°F. Place the loaf pans on a large sheet pan, ensuring that they do not touch. Bake for 20 minutes, rotate the sheet pan 180 degrees, then bake an additional 20 to 30 minutes, until the loaves reach an internal temperature of 190°F. The finished loaves will be brown on the top, golden on the sides, and sound hollow when tapped. Store baked Cranberry Orange Cinnamon Swirl Bread in zip-top bag or wrapped in foil at room temperature for 4 days or wrap tightly in plastic wrap, then foil, then freeze for up to 3 months. Do not store in the refrigerator, as bread will stale. What is the purpose of spreading the rectangle with melted butter before the filling? The butter helps the filling stick to the dough, and also adds more flavor.